Reading through the document there are a number of easily identified objects which are still in UCL museums and collections. For example, in 1861 a Mr Frederick W. Jansen donated “Basaltic Columns from Giant’s Causeway” (still on display in the Rock Room) and in 1912 a certain Countess of Lovelace donated the “Robert Noel collection of casts and heads”, which are still on campus today. Other notable objects include a 10-inch theodolite and 100 inch standard scale donated by Flinders Petrie, a collection of surveying instruments donated by Professor Chadwick in 1906 (who has a building named after him, which houses UCL’s geomatic engineers) and in 1829 The Society for Diffusion of Useful Knowledge helpfully donated ‘maps’. 1828 ‘Specimens of objects of natural history’ Dr. A. Thomson and ‘Natural History Objects’ from Lady Raffles. There are two references to a Dr.Grant, presumably Robert Grant who the museum is named after, one donation just listed as ‘To Dr.Grant’s Museum’ from ten named donors and another entry which is just ‘Donation to Museum of Natural History’ from Dr. Grant himself. Annoyingly, with these generic natural history bulk donations there’s not much of a chance of identifying specimens donated by these individuals in the collection and in my time here I haven’t found reference to many of the names of donors of these collections in the specimen documentation and on labels we have today. 1829 Skull of Alligator from Ganges and Tiger from Bengal. The Warden. 1829 Mounted Bittern and Great Weaver Fish of Pennant. Mr. Kennell. 1860 Two Stuffed Leopards. Case of Dry Insects (2000). Dr.W.W.Johnston. 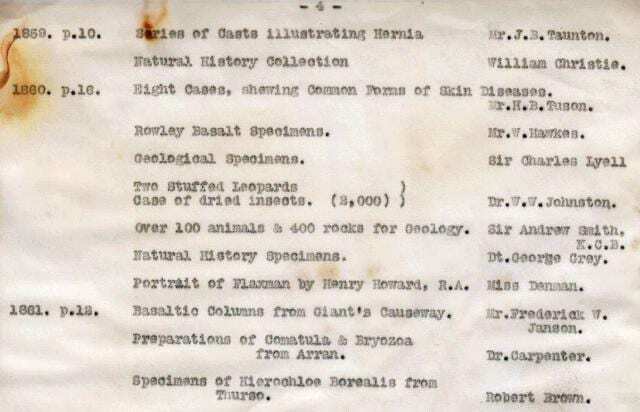 Which would have been a very exciting find except almost all of the above (except possibly the tigers and ‘Ganges alligator’ skull) are no longer in the museum and aside from this document I haven’t found a single reference to them. How exactly does one misplace a stuffed hippopotamus and two stuffed leopards? It’s not clear if all of these specimens were destined for the museum so it may be that some of these ended up in different parts of the University (alas no comedy Orang-utan is listed). We know from some of our other documentation that specimens were sometimes traded amongst scientists and science museums, the dugong skeleton in the museum was swapped for a large manatee skeleton by Professor Lankester in 1879/1880. One worrying thing that unites a lot of these is that they are taxidermy specimens so it may be that they were destroyed or damaged by pests and subsequently thrown away. 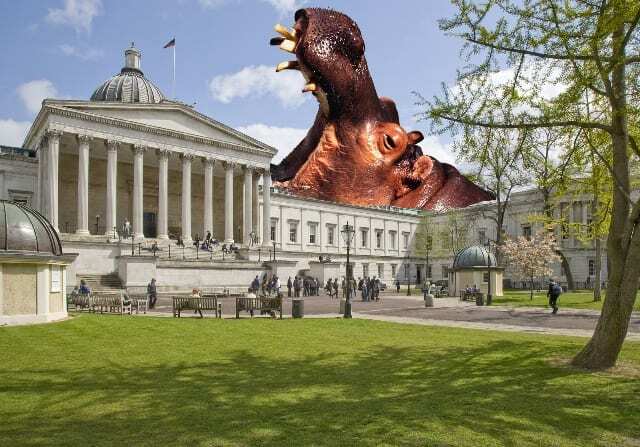 Of course, there’s a possibility that some of these are still somewhere on campus so if any of our UCL colleagues spots a zebu cow carcass or stuffed leopard or if there’s campus mythology about any of these specimens, no matter how tenuous, please do get in touch! Have you still got the ‘series of casts illustrating Hernis’? They may show the consequences of lifting a stuffed hippo…!